Storms not only damage homes and businesses but they also damage agricultural land, including timberland. Landowners who have forests affected by storms should take immediate action to mitigate their losses. The best way to determine the extent of storm damage to a forest is by walking or riding the boundaries of the property and throughout individual stands, if it is safe to do so. Roads, fences, gates, and stream crossings may also be damaged (figure 1). Repairing them is important because logging trucks and other logging equipment must have access to the property to harvest trees. Minor bending or leaning. These trees will often naturally recover, and it is best to wait and see before conducting a salvage cut (figure 2). Uprooted. Completely uprooted trees are more likely to have undamaged wood and will dry out more slowly than broken trees (figure 3). Uprooted trees may still be suitable for harvest within 2 to 3 months. However, they will soon succumb to fungi and wood-boring insects. Figure 2. Some of the trees show only minor bending and should be left but monitored. Broken tops or trunks with less than four main live limbs left or severely bent. These trees are not suitable for lumber or plywood because they likely have internal wood damage, such as ring shake and pulled fibers. However, these trees can be harvested for pulpwood, mulch, or particleboard. If a larger tree is broken near the base (figures 4 and 5), it can often still be used for solid wood products such as saw timber or chip-n- saw. These trees need to be harvested as soon as possible because they will dry out quickly. Ring shake and pulled fibers are inevitable if the trunk is broken. If the tree is still standing, rink shake and pulled fibers are more likely when winds come in alternating directions, such as during hurricanes. Broken tops or trunks with more than four main live limbs left. If trees are reasonably straight and have at least four main live limbs remaining on the tree, they will likely survive (figure 6). However, growth will be reduced until the crown redevelops. These trees can be retained, but they need to be closely monitored for signs of beetles, which are more likely to attack stressed and damaged trees. Figure 3. Uprooted trees as a result of storm damage. Major wounds. Major wounds are defined as those that are more than 1 square foot in size (figure 7). If these wounds are extensive in a stand, the trees should be harvested as soon as possible because pine beetles will target the damaged trees. If the trees have only minor damage, they will often naturally recover. All salvage cuts should place priority on the highest-value timber first, and then lower value (smaller diameter) stands can be focused on. If less than 20 percent of the stand is damaged, landowners don’t need to harvest the entire tract. If the damage is in small pockets, consider small clear cuts or group selections. If the damage is spread out, the trees can be harvested as part of a thinning operation. Aside from the obvious impacts to timber products, nontimber products, such as pine straw, can be heavily affected by storms. Needle loss can occur from storm winds that might not otherwise cause major structural damage to trees. Pine straw lost from a storm is not likely salvageable because of the amount of debris (cones, limbs, etc.) that will also be blown to the forest floor. Figure 4. Severely bent and leaning trees as a result of storm damage. After a storm, landowners or production companies will have expected costs associated with cleanup, such as removing debris, trimming limbs, etc., to prepare the site for straw harvesting in future years. These costs can potentially range from $20 to $60 per acre. Exact costs will vary depending on location and storm strength. Landowners should reference their contract with the straw production company to determine responsibility for cleanup as well as for other landowner rights. The most serious risk to forests after a storm is from the southern pine beetle. Southern pine beetles are capable of killing a healthy tree, but a tree damaged by a storm is especially susceptible. Weakened pine trees emit a scent that attracts the beetles, and once an infestation starts, they can damage and kill large tracts of timber, sometimes hundreds of acres. 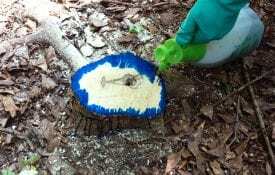 Other pine beetles, such as Ips and black turpentine beetles, are also a threat but normally in tracts 15 acres or less. Salvaging and removing damaged trees soon after a storm is the best way to protect timber from beetles. Figure 5. Trees broken near the base can sometimes still be used for saw timber or chip-n-saw. Storms of all intensities will cause needles, leaves, branches, and other fuels to fall to the forest floor. Excessive fuels can lead to intense wildfires if they are not removed. The best way to remove fuels is with a frequent prescribed fire program. If a salvage cut is not conducted, downed trees and slash should be pushed into piles to be burned. Well-maintained roads and fire lanes can help prevent wildfires from spreading. Financial returns from timber salvage harvest will likely be lower than returns during normal harvesting operations. Aside from the likely decrease in timber value because of individual tree damage, selling timber following a major storm often brings lower prices from an abundant supply of timber entering the market. Further, the costs of logging may increase because of site conditions following a storm. Both increased costs and decreased value received for timber will lower financial returns. Forest landowners who lost timber during a natural disaster may be able to reclaim a portion of that investment through a casualty loss deduction when filing their federal income tax. Timber destroyed by an event, such as a hurricane, that is abrupt, unusual, and unexpected is eligible for a casualty loss deduction. The timber must see an abrupt drop in value rather than a slow decline in value. Trees that die or are degraded because of insects or disease would not meet the definition. In other words, the decrease in value of timber must be a direct and immediate result of a storm. If landowners meet the requirements for casualty loss deduction, they must determine the monetary value of the loss and account for any insurance proceeds or salvage value received. For more information regarding casualty loss deduction and timber tax laws, please visit https://timbertax.org. The first step after following a casualty event should be to contact a registered forester. Proper site preparation in storm-damaged areas is important because storms leave fuel that can lead to wildfires, and invasive species are prolific on disturbed sites. Conduct a prescribed fire to remove slash and other fuels, then follow up with an herbicide treatment to combat invasive species and other competition. When the site is properly prepared, it can be replanted with the landowner’s desired species. Figure 7. Trees with major wounds (center left) should be harvested as soon as possible. Making decisions regarding damaged timber following a storm can be time consuming and complex. These decisions must be made in a timely manner so the damaged timber is not wasted. 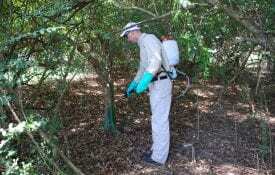 The help of a professional consulting forester can be invaluable. By law, professional foresters are required to meet certain requirements and must be registered. To find a consulting forester, visit https://www.acf-foresters.org/. If the property is enrolled in federal cost-sharing programs, such as the Conservation Reserve Program (CRP) or the Environmental Quality Incentives Program (EQIP), alert the local United States Department of Agriculture Natural Resources Conservation Service (USDA-NRCS) or the Farm Service Agency (FSA) office and request guidance on salvage cuts and reforestation. 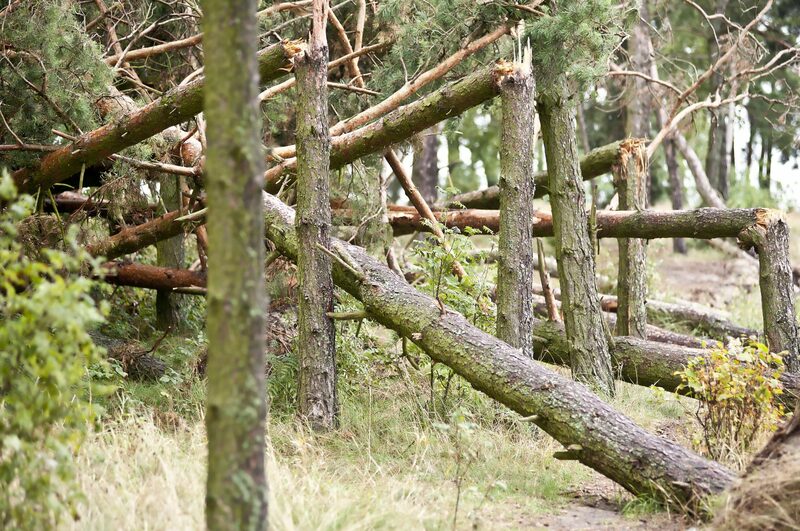 Download a PDF of Assessing and Managing Storm-Damaged Timber, FOR-2066. Figure 8. Debris from storms should be removed before pine straw is harvested.